Glad to announce that the first compilation on our own in-house label now is available for purchase through the Shop. Light & Sound of Mogadishu comes as first of it’s kind, a unique compilation of tracks from the seventies Somali scene. 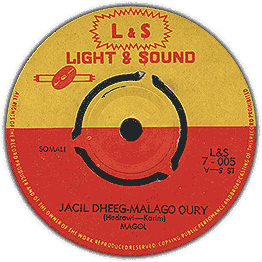 Light and Sound was a was a small label and shop that operated in the ‘Cinema Hamar’ complex downtown Mogadishu. Vinyl singles was shifting hands among electronic equipment and lighting products. 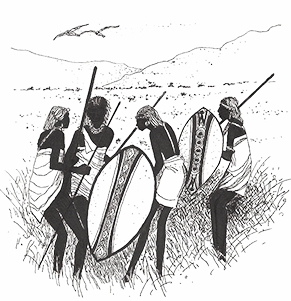 From the funky fused organ led rhythms of The Sharero band to the mesmerizing voice of Magool. Light & Sound had the sounds of the times! The vinyl has 7 tracks, the digipack CD has 8. Compilation comes fully remastered with liners and pictures. Read the press release through this link. In shops from the 29th of august. The bonus track on the CD is the excellent guitar percussion driven ‘Jacil Dheeg Malago Qury’ Hear part 1 and 2 in the mp3 link below. Translated to “Is Love Written in Blood?” thanks to Risto Nevanlinna for letting us borrow the original for the master and Lidwien Kapteijns for the translation of the song title.